ODIM is a mix of local and foreign staff dedicated to providing better futures to the people of San Juan and San Pablo La Laguna. Amy grew up in the UK, but spent periods of her childhood in the developing world which led to a fascination with learning about different cultures and a passion for fighting for equality. She fell in love with Guatemala on her first visit in 2004. On returning to the UK, Amy obtained a degree in Latin American Studies, before starting to work for Education for the Children Foundation (EFTC) in fundraising and donor relations. In 2010, Amy moved to Guatemala to become Director of EFTC, and led a team of 50 staff providing education, healthcare and social support to 600 children and families living in poverty in Jocotenango. After 4 years in Guatemala, Amy moved to Vancouver, Canada and worked in Monitoring & Evaluation for an organization developing Criminal Justice Systems in multiple countries around the world including Guatemala. In 2017, Amy found ODIM, and moved back to Guatemala to take on the role of Executive Director. She is excited about taking on the new challenge of working in a rural Guatemalan community and is attempting to learn Tz'utujil. Emma joined ODIM in the summer of 2017 as the community health and education program manager. She came to the organization after working at the Centers for Disease Control on Water Sanitation and Hygiene research and completing a degree in Community Health at Tufts University. Emma works with program coordinators and partners to continuously improve ODIM’s community health programs and reach greater impact. One of her favorite parts of her job is how closely she gets to work with ODIM’s staff: from problem solving, to watching their faces as she horribly mispronounces something in Tzutujil. Melyna joined ODIM as a health promoter for the diabetes program. In March of 2014 she became the new coordinator for the Beca (scholarship) program, serving as a liaison between the students, their teachers and parents to assure the best possibility for our students to succeed. She was also the coordinator of the diabetes health education program where she managed the heath promoters who work as diabetes educators, updated the patient records and tracked the care of each patient. On February 2017, Melyna was promoted to the Community Health & Education Program Coordinator Position. She is currently studying Clinical Psychology at Mariano Galvez University in Solola. Katja has a Masters Degree in communication and international development, and several years of communication, marketing and project management experience at nonprofit organizations in Denmark, Bolivia and Guatemala. She came to Guatemala for the first time in 2007 to make a documentary for a Danish NGO, but ended up staying for more than 3 years working with community health and communication in the western highlands. In 2018 she decided to move back to Guatemala to join ODIM as the Communication and Fundraising Manager motivated by ODIM’s community driven and socially responsible work. Katja is responsible for ODIM’s communication efforts as well as to secure and sustain existing and future fundraising streams. Pamela was born and raised in Guatemala city, where she made a career as project manager. Moved to Lake Atitlan in 2013 looking to live a life closer to nature, as well as changing carrier paths, hoping to find the one that would fulfill her life and passion, which is to make this world a little better. She joined ODIM in May 2018 and is very keen to meet international volunteers who want to contribute to our communities. Pedro started working with ODIM in April of 2012 as a projects coordinator. He graduated as a perito contador (accountant) with an orientation in computers. His work as a projects manager with Azzi, a non-profit organization in San Pablo, gave him the perfect experience to join our team. Pedro worked as the Beca (scholarship) Project coordinator in San Pablo. He was also the coordinator of our Diabetes Program “Caminemos Juntos.” In February of 2014 he was promoted to Business Manager of ODIM, where he manages the finances of the organization. ODIM is so thankful for Pedro's hardwork, dedication and great ideas! Ester Jackeline Yuliana Julajuj Antonio is from Solola and joined ODIM in 2017 as an assistant to the organization's Business Manager and as ODIM's accountant. She assisted Doctor Georgina in the Clinic Administration and has recently assumed the Human Resources Manager position. Ester is a certified accountant and is currently studying financial audit. She enjoys working at ODIM because of its transparency and its warm working environment. Yaneth Cholotio was born and raised in San Juan La Laguna and first came to ODIM in 2013 as an English-Spanish-Tzutujil translator. Using knowledge gained in two years of medical school, she was always invited to translate for visiting medical teams at the clinic. In January 2015 she became the Assistant to the Volunteer Coordinator and in December of the same year she was promoted to the Manager of International Programs at ODIM. In early 2018, she took the role of Clinic Administrator. She is glad that she can help to improve the lives of the people on her communities, because her dream is that the kids in her community will have better opportunities and live better. This is a dream that stems from the lessons her parents taught her; to learn as much as she can and use it in the best way she can. Georgina is a General Physician with a specialize in Public Health, she also has a degree in Childhood Health, Basic Epidemiology and Food and nutritional Safety.She has more than 10 years of experience working directly with patients in medical clinics in different NGO’s, mobile and communitarian clinics, as same in Health Centers of the Guatemalan health system. She worked eight years in the administrative area of the second and third level of the Guatemalan health attention including hospital; also as an Project Officer in a Swedish NGO. For her the direct attention to the patients in ODIM is a satisfactory experience because in this way we support and help the population in general and we contribute to improve their lives. Gloria worked as the clinic receptionist since 2009 and has now transferred into her current role as “Health Specialist”. 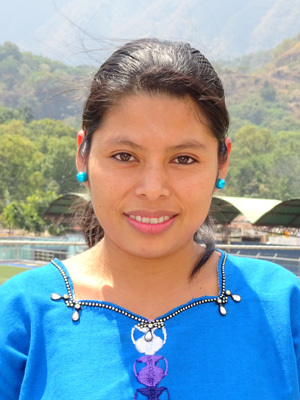 She graduated as a perito contador (accountant), and began working with ODIM shortly after. Gloria is currently studying professional nursing at a local university. Gloria has been trained by ALAS (WINGS) as a representative for family planning, and provides consults with our patients. Additionally Gloria provides Bach Flower consults and counseling sessions for patients with mental health problems as well as performs a variety of tests in our clinic laboratory. Josefa Ixcaya, Nurse (In charge of the Laboratory). Josefa, originally from San Pablo, has been involved with ODIM since 2010. She started as a volunteer health promoter, and then worked as a diabetes health promoter. In this role she teached classes and provided one-to-one support for individuals in ODIM’s diabetes program. She has studied nursing and recently went back to school to get licensed in the field. She is currently in charge of our clinics' laboratory. Her favorite part of the job is learning about the work that the doctors are doing. Her ultimate goal in her work is to be the best pharmacist she can be. Aracely began working as our clinic receptionist in August of 2012. She holds a degree in social work and does a wonderful job interacting with patients and keeping our medical records organized. Before joining ODIM as a staff member, Aracely participated with ODIM as a health promoter for years and we are very excited that she has the opportunity to assume a long term role in our growing organization. Monica, born and raised in San Pablo La Laguna, is honored to have the opportunity to support her community by providing them access to affordable health care. She has been involved with ODIM since 2009 as a community health promoter and a teacher in our scholarship program. She is trained as a teacher and appreciates the opportunity to teach the youth of San Pablo and to continue to expand her skill set. Serving as the receptionist of the San Pablo clinic, Monica is excited to expand her computer skills and also to provide excellent service for patients in San Pablo.